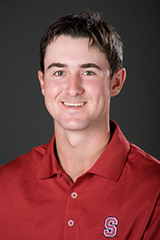 STANFORD, Calif. - Cameron Wilson's favorite golfer is not who you think it is. As a left-hander, one would assume the first year player from Rowayton, Conn. might answer Phil Mickelson, or Bubba Watson or for you historians of the game, the classy New Zealander, Bob Charles. Wilson's going with Seve Ballesteros, the swash-buckling Spaniard whose shot making skills and ability to escape from trouble were second to none when he was atop of his game. Wilson's shot-making skills has made him a regular fixture in Conrad Ray's lineup this season, as he has played in all five events to date, carding a stroke average of 72.8, which ranks third on the team behind Andrew Yun and David Chung. He has recorded two top 10 finishes in five events, placing fifth at The Prestige at PGA West and tying for ninth at the Gifford Intercollegiate. The ambidextrous Wilson advanced to the second round of match play at the 2009 U.S. Amateur and was named the 2009 Metropolitan Golf Association Player of the Year, becoming the youngest recipient in the history of the award. He also excelled in another sport in high school in addition to golf - squash. And if you want to know he capital of Zimbabwe, Kazakhstan or the location of the Eastern Ghats mountain range, ask Cameron. GoStanford.com recently caught up with Stanford's left-hander to discuss his transition to college life, his passion for soccer and his encyclopedic geographical knowledge. Shorehaven GC, East Norwalk, CT.
Friars Head, Long Island NY. Your dream golf getaway package? Scotland, all the great links courses. Always complete my shoulder turn. Best advice you can give a recreational golfer? Work on your short game! I love to hit balls at the telephone pole on our facility. I remember chipping/putting with my dad until it was dark. I was probably 3-4 at the time. When I first broke 100, I was eight at the time. I was playing Andrew Yun in the US Junior Amateur back in 2008, and I was down three or four holes by the par 5 sixth hole. After hooking my drive into the trees, I hit a punch three iron around the trees, over/around a water hazard, and it rolled from 20 yards short of the green to about five feet. Toughest hole at Stanford Golf Course and the key to playing it? The third, you can't go left! But right is usually a tough par as well. Best hole at Stanford Golf Course? Number two, you must hit two good shots to have a birdie putt. Longest hitter on the team? Steven Kearney, mostly because his biceps are so big. Who is the last guy on the team who want to face in a putting contest? It just has to be big enough to see. I like them all, can't play favorites. Myself, Seve Ballesteros, Jack Nicklaus, Tiger Woods. I'm always thinking about my putting. It is the ideal blend of golf and academics, not to mention the awesome campus, people, and weather. Tell us about your introduction to French cheese at Isleworth? Coach Rowe had some French friends that were in Orlando to see Disneyworld. They came and watched us, bringing along some wheels of cheese. Coach Rowe then put the cheese in our van before our round started...that van still reeks. Tell us about your IHUM course taught by Tobias Wolf? It was called "Journeys." We read and discussed books in which someone goes through a transformation. He gave some pretty intense lectures. Funniest guy on the team? Sihwan is always laughing about something. Too many to list...most common is "lipstick on a pig." Is it true you have the biggest sweet tooth on the team? It's pretty close between myself and Coach Ray. Apart from the Siebel Center, I would say the Oval. Your most difficult challenge your freshman year? Sleep! Also working on the road can be tough. Last trip I had to write a paper on the plane. Tell is about your interest in squash? I played for my high school team, and a bit in middle school. It was a great way to stay active in the winter and I enjoyed the chance to take a break from golf. Most of my peers played golf all year. What are some of your interests other than sports? I enjoy watching soccer a lot. I'm also I'm a big fan of Monty Python movies and shows. I played soccer growing up until high school. I would've loved to keep playing but golf became my main focus. When I was little I liked Man United because my British cousins brainwashed me. Then I realized that liking Man U was similar to liking the Yankees, so now I root against the big teams (Chelsea, Utd, Arsenal, Madrid...) But my favorite player is still a guy on Man U. named Paul Scholes. I already have enough to worry about! I know a lot of obscure geographical knowledge. I guess I've always been good with maps, plus I took a geography course this fall and I still remember a lot of the countries/capitals. Local Hero, a Scottish comedy from the 80's. U2, Dire Straits, and a lot of the Beatles. Only a few dozen newer songs. 5. Is there a favorite practice drill to pass onto the Stanford golf community? "Ten Chance" - You get 10 drives to hit between a 25 yard wide target. Once you make 7/10 you advance to the next stage which is 20 yards wide. 10 Chance- you have to hit 7 of 10 drives in a fairway of 25 yards, if you do that then you go to 20 yards and do 7 of 10, and finally you move to a 15 yard fairway and you are a graduate from 10 chance if you can get 7 of 10 for the third time. Around the practice green I take five balls and toss them randomly in a general spot, then pick a hole and try to get them in the hole in ten strokes or less. The idea is to pick spots that are feasible as to build confidence and not to leave a spot until you’ve successfully gotten the five balls in the hole in ten strokes or less. Our new assistant coach, Coach Rowe, has introduced us to a great driving drill that we have used extensively this fall called “10 chance.” We set two flags 25 yards apart from each other, 260 yards from the tee. Then we get 10 shots to land 7 balls in between the flags. If you make 7 or more, you set the flags at 20 yards apart and then 15 yards apart after that. You only get 1 chance at the drill per day. It’s great at improving your driving and at building up pressure. We have been doing this drill that Coach Rowe taught us called 'Ten Chance.' So you place flags or something of the sort out in the distance 25 yards apart, 20 yards apart, and 15 yards apart. You get ten balls and a tee box facing towards the flags. Go through your routine for each ball and try to hit it inside the 25 yard flags. If you make at least 7 out of 10, you 'graduate' to the 20 yard flags. Same rule applies to that. We only do this once a day because it makes it more realistic to actual tournament conditions. This drill has increased my confidence on the golf course. My favorite way to practice is to hit balls at the telephone pole over by the wedge tee. I like to throw kettle bells. I own a training aid called the PowerStrap. Excellent for practicing one's pivot! I like to use a string in putting to correct and enhance my putting stroke. Can you share a funny story about a teammate or coach? 4. Can you share a funny story about a teammate or coach that happened this fall? When we played at California Club this Fall, the whole team came wearing shorts. The club only allowed pants, so we were left to scavenge through the locker room looking to borrow pants for the day. It ended up that we only found waist size 36. The whole team was drowning in their pants the whole day. It provided for a funny twist in qualifying. Steve Ziegler and I were on the putting green having a putting contest one afternoon when Freshmen Cameron Wilson and Shane Lebow walked up to the green. Steve and I had just finished up our contest when Cameron throws a couple of balls onto the ground and begins to putt. Forgetting that Cameron is left handed and thinking he was putting the other direction, I accidentally step directly in his line and stand there. Cameron politely asks me to step aside and I do. Apparently unaware of what had just happened, Steve steps directly where I had been standing, right in Cameron’s line. Steve drops a couple of balls down and putts to the hole. Cameron chuckles and asks Steve to move. Steve doesn’t, so Cameron proceeds to putt anyway. As the ball is rolling towards Steve’s feet, he winds up with his putter and smacks Cameron’s ball about 40 yards off the green. Steve smiles, and says, “Okay, I’ll move,” and walks off the green. Shane, Steve, and I had a good laugh about that for about five minutes and Cameron eventually joined in as well. I remember laughing at this story when Sihwan told it to me. So the team was supposed to meet at the clubhouse and Sihwan was going to take Cameron up with him because they live in the same dorm. Sihwan gets in his car and was about to call Cameron to see where he was. But he sees Cameron already sitting in the passenger seat. Sihwan was obviously a little surprised at seeing him in his car and Cameron promptly said, "You should be more careful about locking your car." At Isleworth, some French friends of Coach Rowe were in town to see Disneyworld. They came by and watched us for a day, bringing some horrible French cheese with them. Coach Rowe then put the cheese in the 100 deg van for a whole day. I guess he didn't have his thinking cap on. The van still probably smells awful. I think most of this fall's funny stories involve Steven Kearney and his undying love of the bicep curl. He's all about the beach body workout. Curls for the girls. I don't have funny story this year but last year, we left Steven Kearney at the airport on our Arizona trip. Sihwan Kim walked into workouts with a mohawk. The look on coach's face was pretty funny.